Six people were arrested and 12 were injured among approximately 2,000 people at the University of Massachusetts Amherst who were mourning their home team's loss in one of America's biggest sporting events. Students and other fans had gathered on the Southwest plaza of the campus after the New England Patriots' loss to the Philadelphia Eagles on Sunday in Super Bowl LII, according to a university statement. Campus police reported that some people in the crowd threw beer cans and set off smoke bombs and firecrackers. After multiple dispersal orders went unheeded, police said they used pepper spray on the crowd. Twelve people were taken by ambulance to local hospitals, having suffered head injuries, lacerations and alcohol intoxication, according to the Amherst Fire Department. The Massachusetts state police and the Amherst police were also at the scene, according to the statement. Campus police said they were filing criminal charges and launching a full investigation. On Twitter, many users posted videos and tweets showing a crowded and chaotic scene. Meanwhile, celebrations in Philadelphia were joyous but no less raucous. Fans lit fires, overturned cars, looted and tore down light poles. 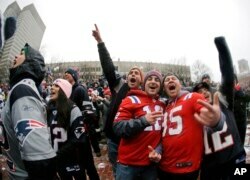 The atmosphere in Boston this year was much different than last year, when the Patriots won the Super Bowl. "I still remember how exciting the parade was last year," said Rui Huang, a graduate student from Guangzhou, China, who is studying journalism and international relations at Boston University. FILE - New England Patriots fans cheer during a rally Feb. 7, 2017, in Boston, to celebrate the team's win over the Atlanta Falcons in the Super Bowl. "I love the New England Patriots, and I followed every game they played this season," Huang said. "I feel that watching football together with my classmates from the U.S. definitely brings us closer," he continued. "We cheered and laughed together, and it's pretty cool." Yvonne Shijie Ye is a journalism and international relations student at Boston University and an intern at Voice of America's Student Union. Please visit our Facebook, Twitter, Instagram and LinkedIn accounts to tell us what you think of the Super Bowl celebrations.